"KNAC was the first radio station to play us and help us break out. They helped us play our original demos and original first hits and were very early to the game." Few Rock N Roll bands can stand the test of time and still have all original members. One of the only ones I can think of is POISON, one of America’s legendary Rock N Roll bands. POISON has sold over 40 million records and has had at least a dozen top ten records. 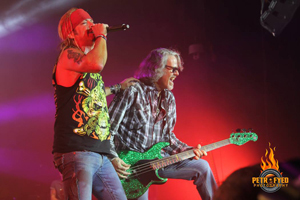 POISON has the staying power to have a career that spans thirty years and is still Rocking Hard! 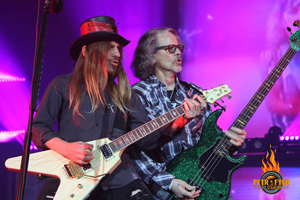 I caught up with POISON’s bass player Bobby Dall while they were on tour with CHEAP TRICK and POP EVIL on their “Nothing But A Good Time Tour 2018”. 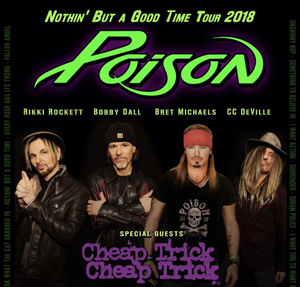 If you are looking to have “Nothing But A Good Time” this Summer I suggest you hook up with POISON, CHEAP TRICK and POP EVIL on tour. I didn’t include all of the laughs we had but I will tell you we had “Nothing But A Good Time” and I loved every minute of it. KNAC.COM: Greetings, I’m going to put you on speaker, so I can record our conversation if that is ok? It is a pleasure to meet you. So POISON is still the original line up? DALL: Yes, we have the original line up from the very beginning days, the very first Album: Bret Michaels-Lead Vocals, Guitar, CC DeVille-Guitar, Bobby Dall-Bass, Rikki Rockett-Drums. And we’re out here with CHEAP TRICK and the guys in POP EVIL just having a blast. KNAC.COM: That’s awesome. So you guys have sold over 40 million records and DVD's and have had 12 top ten songs. KNAC.COM: I did a little bit of homework… (Laughs) So how do you guys keep it together and keep it fresh after all this time? DALL: You know it’s really about the audience and the fans, because every time we go on tour it’s bigger and better every year. DALL: So really that’s why we remain together and even tour together year after year. There are some years we take off when our schedules permit it but you know we always try to go out. It’s really all about the fans. KNAC.COM: I have always heard nothing but good things about you guys over the years. DALL: I’m very glad to hear it. Now KNAC used to be based out of L.A. right? Are they still out of L.A.? KNAC.COM: Yes. I grew up listening to KNAC out of High School in California. But now KNAC.COM is The Loudest Dot Com On The Planet… you can hear KNAC just about anywhere! DALL: KNAC was the first radio station to play us and help us break out. They helped us play our original demos and original first hits and were very early to the game. KNAC.COM: It'ss the 30th anniversary of Open Up And Say Ahh and you guys are rocking hard. DALL: That’s why we named the tour “Nothing But a Good Time Tour”, a celebration of the 30th Anniversary. KNAC.COM: Let’s talk about song writing a little bit. Do you guys write together or does one of you do all the writing? DALL: If we’re talking into the particulars, in the beginning stage the first ten or twelve years of our career we just spent entirely most of the time together, we didn't get much time apart from each other. We would be on tour for a year and a half and you get your entire youth to write your first album then you come back and have to write the second album and then we went from touring for a year and half or so straight into the rehearsal studios for about two months and then into the recording studios for a couple of months and recorded the second album. You know we always just jump into a room and spend five days a week basically like any other job 9 to 5, not so much like 9 to 5, probably more like 2 to 8. KNAC.COM: (Lot’s of laughing) Thanks for your honesty. DALL: You know we had lived together during the time period of recording and writing the first album, but on the second album we all got our own places and stuff after the first album. But we still spent a lot of time together either rehearsing, recording or touring together at all times about 84-85 all the way through 92–93. There were no breaks, there was about a week off for Christmas. KNAC.COM: I know you guys have been hitting it pretty hard and heavy pretty steady. DALL: Absolutely, the beginning day was a blur. KNAC.COM: Hopefully you are doing some enjoyable things also. DALL: Absolutely. I spend time with my children Zack and Zoey, Zack is 27 and Zoey is 21. My children are a little older than the other guys, but I had them young. KNAC.COM: When did you start playing Bass and what inspired you to play? DALL: You know the truth is I was inspired to play bass by the want ad, I started on guitar at a younger age, I was about 16 when I switched. That same year is when I joined POISON. I still do play guitar, I play bass, I play a little drums and keys. KNAC.COM: Do you strictly work with POISON or are you involved with any other bands? DALL: For the most part I stick with just POISON. I have a lot of business ventures that I do on the side but it’s not Rock N Roll. As far as my musical career goes POISON is enough for me. I love working and I love performing with this band. Outside of the band the things that I do are financial, not very Rock N Roll ((Both Laughing). KNAC.COM: That’s cool though because a lot of guys don't think about that part. DALL: There’s a lot that don’t. KNAC.COM: I know and not even just in Rock N Roll either (laughs). What is one of your favorite venues to play and where is it, you know like the “Mason Jar” In Phoenix? DALL: That’s a tough question. A lot of people ask that question but every year I’d have to say I probably have a favorite show that I had before but it isn't any one city or any one venue. You know all the venues are great, the reactions and all, you know a lot of it depends on your performance and how you feel about your show. Any given year it’s a different city and that’s my favorite show. KNAC.COM: You guys have a lot of great shows then. DALL: Yeah, every night is fun. KNAC.COM: What is the craziest thing that ever happened on tour? I’m sure you get asked that a lot but I think fans love to hear stuff like that. DALL: You know I was telling a story the other day and I want to make sure I say it correctly. We had the same Manager that managed David Coverdale (WHITESNAKE) so we were in Reno, Nevada and it’s when Jimmy Page (LED ZEPPELIN) was working with David Coverdale on COVERDALE/PAGE and Jimmy came out on the stage to play “Rock N Roll” for us for the encore and he didn't see the area where there was a hole in the stage at the front where there’s like three of them, it’s designed that way, the stage is, and he fell down and hurt his back. To have Jimmy Page up on stage playing "Rock N Roll" with us and for him to fall down and be on his back that’s one of the craziest things that ever happened. So if your out there Jimmy, I hope your back is all better and God Bless you. KNAC.COM: What advice would you give to beginning musicians about getting started? DALL: Get ready to work 24 hours a day 365 or you don't get into the industry. KNAC.COM: That’s right. (Lot’s of laughing) Surprise! DALL: It’s really the only advice I ever give to anybody. KNAC.COM: The rest they can figure out themselves right? DALL: Yes it’s definitely a tough road to go down. It’s a great gig if you achieve success it’s fantastic. For every one that makes it there is several ones that don’t. KNAC.COM: What bands are you influenced by? DALL: You know everything from the 60’s and the 70’s.THE ROLLING STONES are one of my favorite bands, AEROSMITH, CHEAP TRICK who is out here touring with us, they were actually one of the very first concerts I bought. VAN HALEN, I mean I could just keep going on down the list you know and I like all music. I like all categories. KNAC.COM: What kind of stuff do you like to do on your time off? You said you like to spend time with your family, do you have any hobbies? DALL: I stay very busy with my family and everything that I’ve got going on. I live down in Florida, the other guys all live out on the West Coast. I spend a lot of time at the beach, I’m a beach bum. KNAC.COM: What a drag. (mucho laughter) Well that’s awesome and a good way to spend your time off. I don’t know if you are a “picture taker” or not but if so, what is the last picture you took? DALL: What is the last picture I took? DALL: I got my phone right here, gimme a second. The last picture I took was of me and my ex in Texas. DALL: Because my son had requested a photo of me and my ex because he said he doesn’t have a photo of the two of us together. I’m still good friends with her so I took a photo and shot it to both kids actually. KNAC.COM: Have you been to the movies lately? What did you go see? DALL: I love going to the movies. So yeah I’ve seen a lot of great movies. We went and saw Heritage last night, wasn't that impressed with it. You know this last year probably my two favorite movies that came out in the last year or so were Sicario and Triple 9. KNAC.COM: O.K. I have a very serious question for you… Bigfoot or Alien? KNAC.COM: That is where we part ways… (Laughter). What would you like your fans to know? DALL: Keep coming. Keep supporting the band. Because that really is what the band is. The band is, I mean we do our job, and do it as well as we can do it. But really it’s about them. I love all the fans, the day they stop coming is the day I’ll cry. So that’s what I want to say, please keep coming. God Bless you all. KNAC.COM: Do you have anything else you would like to talk about, maybe something I didn't touch on? 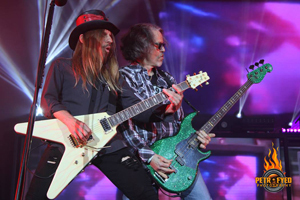 DALL: CHEAP TRICK & POP EVIL one more time. Great guys we've known them a long time. The POP EVIL guys we just met this year, but the CHEAP TRICK guys we’ve known a long time. Just having a blast, having Nothing But A Good Time.